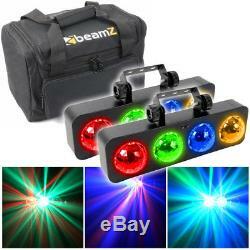 2x Beamz DJ Bank LED Chasing Lights Bar Disco Lighting + FREE Transport Case. These two BeamZ DJ bank lights are a fantastic, easy to transport lighting unit with full potential. Perfect for mobile DJs, Karaoke nights or home party use these 4 colour lights comes with a remote control allowing you to easily switch how the units chase through effects and colours from the speed controllable auto setting to the sound activated setting. These lighting units are lightweight and comes fitted with adjustable mounting brackets for secure attachment and directing. To store your lights or carry them venue to venue, we have provided you with a transport bag. FFA1557 - BeamZ DJ Bank 4 Colour Light. 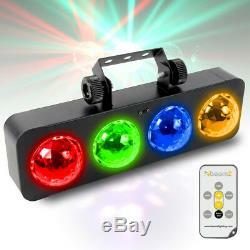 The BeamZ DJ bank light is a fantastic, easy to transport lighting unit. Perfect for mobile DJs, Karaoke nights or home party use this 4 colour light comes with a remote control allowing you to easily switch how the unit chases through effects and colours from the speed controllable auto setting to the sound activated setting. This lighting unit is lightweight and comes fitted with an adjustable mounting bracket for secure attachment and directing. Selectable sound active or preprogram function. Lightweight and perfect for any DJ. Rated Voltage: AC 230V /50Hz. LED: 4 x 3W LED RGBA. Function: Sound, auto and IRC. Li>Dimentions per unti: 415 x 195 x 150mm. Video will open in a new window. 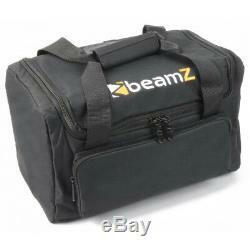 HHA0324 - Beamz AC-126 Protective Lighting Soft Case. Introducing the fantastic AC-126 soft case from Beamz. This stylish, sturdy and practical soft case is primarily designed to protect and extend the life of your mobile lighting fixtures. Its wide opening allows for a variety of fixtures to fit inside and gear to be removed quickly and easily, all the while assuring complete safety for your prized lighting units. Also fits other products and accessories, making this the ultimate soft case for mobile DJs, karaoke rigs and working bands. Quality protection for mobile lighting fixtures. For storing extra Lamps, Clamps, Cables and other Accessories. Saves valuable transport space by allowing fixtures to be stacked without having to be boxed. Secure view windows make it easy to identify specific fixtures even after they have been packed. Dimensions (Internal): 14 x 8.25 x 8 inches (355 x 205 x 200mm). A tracked service is available when you select a 48 hour or 24 hour courier service. Due to our carriers charging extra for Highland and Islands, we need to pass this charge onto our customers. Can I come in store and collect my item(s)? Sorry - we do not accept reservations on items. How can I return my item? The item "2x Beamz DJ Bank LED Chasing Lights Bar Disco Lighting + FREE Transport Case" is in sale since Wednesday, October 17, 2018. This item is in the category "Sound & Vision\Performance & DJ Equipment\Stage Lighting & Effects\Stage Lighting Systems & Kits". The seller is "electroxtra" and is located in Thurrock, Essex.